Erdogan’s close circle—particularly after the eviction of Gül, of well-known founders of the Party (such as Bulent Arinc), and then of Davutoglu—is increasingly made of rather young journalists, economists, and non-confessional politicians without previous political allegiance. Their ideological trajectory is hazy, to say the least. For them, identification to Erdogan has become a political cause in itself. This is of course a deliberate choice by the Reis who no longer wants to be hampered by strong-minded political figures taking the liberty of showing their disagreements with him. However, the confidence with which these newcomers express themselves in the name of Erdogan, criminalizing any difference of opinion, particularly after the coup d’état, has given rise to much protest on the part of conservative-religious segments and, in particular, from older members of the party. The intervention of pseudo-journalist Cem Küçük during a television show a few days after the referendum thus caused a controversy which crystallized these various antagonisms. A Reisçi chronicler and commentator whose trademark is to call publicly for sacking, media lynching and even for the arrest of dissident journalists, intellectuals and politicians, Cem Küçük this time tackled Islamists, and in particular the foundation which had organized the Gaza Freedom Flotilla of 700 people on the Mavi Marmara which ended up attacked by the state of Israel in May 2010, killing nine volunteers. “It is time for AKP to dissociate itself from radical Islamists, those crazy guys of the Mavi Marmara absurdly fighting Israel, fighting the West, fighting everything. I have a hunch that this is what M. Tayyip [Erdogan] is about to do.” Küçük’s provocation has triggered a large polemical uproar which was viewed by public opinion as a way of settling accounts between Reisçis and Islamists. The state of mind of the “old guard”, defenders of the Islamic cause, is well reflected in the words of Ahmet Tasgetiren, a longtime Islamist columnist. In one of his pieces, he writes that “the tam-tams of anti-Islamic war declared by a group which pretend to be backed by the Reis” are the greatest plot against Erdogan. “Enough with those attacks by a group that nobody knows who they are [the members] or where they come from! Enough with those lowlifes who are slinging mud every day! The Islamist/non-Islamist divide will destroy AKP (…) This is an operation against Erdogan and AKP. (…) Some people want to blast the mission AKP was created for, that’s my analysis.” (Star, 27 April 2017). After the end of fasting, I meet with Cihangir Islam, a dissident Muslim intellectual, in a small pizzeria around Taksim to ask him about the supposed debate between Reisçis and Islamists. In the 1990s, Islam was one of the close advisers to late Necmettin Erbakan, a historical figure of Turkish institutional Islamism and leader of the Millȋ Goruş movement. Mazlum-Der, the human rights organization with a strong Muslim spirit founded by Cihangir Islam in the same decade was recently confiscated by the AKP through a change of leadership. Islam also contributed to the Has Party, founded in 2010, which promoted religious-minded democracy and social justice, and was ultimately dissolved by merging its direction within AKP. A professor in surgery, Cihangir Islam was recently dismissed from his position at university by a decree from Erdogan himself further to having petitioned in favor of freedom of speech in support of academics blamed for petitioning for peace. If the controversy did somewhat abate after the Reis intervened, grievances continued to accumulated over the summer and new debates started off along the same dividing lines. At the end of May, President Erdogan finally announced his explanations for the drop in votes during the referendum: his party was struck with “metal fatigue”. 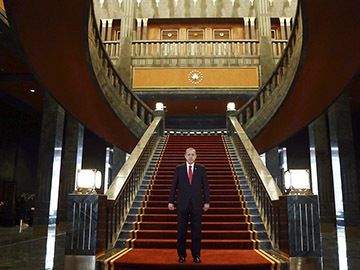 Well aware that he faces a major risk of losing power at all levels in the forthcoming elections of 2019, the Reis has been calling on every occasion for a “profound change” in party leadership, for a renewal of the cadre promoting the young and women. Although Erdogan has asked those who felt weary to pass on their responsibilities, his call was heard, quite rightly, as an announcement of purges to come targeting “proxy-Gulenists”, people acting in the name of the brotherhood (the so-called “Fethullahist terrorist organization”) within the Party. The daily newspaper Karar, which concentrates the main AKP dissidents and is suspected by Reisçis of being piloted by Davutoglu–as his former adviser, Armenian liberal intellectual Etyen Mahcupyan regularly writes in it—has responded to that “fatigue” type of explanation while not directly standing against the Reis. Longtime journalist Mehmet Ocaktan, also a former AKP representative (as well as poet), thus criticized that interpretation by putting it in perspective: “If the President has felt the need of intervening directly, it must be that he realized that the party was considered weary by the public. But the main question is to know whether it is only a problem of fatigue in its leadership or about the dimming of its bright discourse on universal standards of liberty, democracy and change which AKP had proposed to the society as its founding philosophy. (Karar, 18 August 2017) According to Ocaktan, the renewal effort conducted of the party must be accompanied by a reflection on the causes of its closing down upon itself, of its way of “explaining nearly everything through the ideas of fatherland-nation-foreign enemy” (Karar, 21 August 2017). Much more explicitly, Karan Albayrak; another columnist at Karar, insisted that the Party needs to recover some heterogeneous views “likely not to crumble under the charisma of a leader.” He calls on the “older figures in the Party, the MPs, the ministers and former ministers to express their reactions publicly.” As he suggests; “If it has become useless to speak behind closed doors, the only alternative left is to discuss openly in front of the public in order to create some social pressure.” Karar, 14 September 2017). The original version of this article Turquie. «La fatigue du métal». Controverses et polémiques au sein de l’AKP aux lendemains du référendumappeared on the site A L’encontre in September 27, 2017.